Let me be upfront. I think I have a problem. I think I genuinely don't like werewolves. I am not really sure why, but werewolves and I really don't get along. There are two exceptions to that rule- one indie book and the first book in this series, Hemlock. 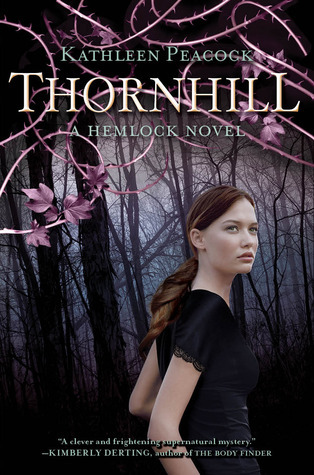 I am not sure if it was timing, or the plot, but although I enjoyed Thornhill, it really didn't wow me like the first book did. I really enjoyed reading about Thornhill itself- the author did a masterful job of creating this place and making it feel incredibly authentic. I think my real problem was the people. It has been an entire year since I read Hemlock, and other than a few plot points- I had really forgotten the entire plot of the book. I found it difficult to read to start with for that reason. The second book starts without any recollection of the first book. I usually like that about books (I find recaps a waste of time). In this case, it really hurt me. I found myself needing a few chapters to really figure out what was going on. There was a decidedly huge lack of romance in this book. I am not entirely sure why because I remember it was one of the main themes of the first book. That being said- the plot that was there was absolutely interesting (and at some points super creepy). I really enjoyed the time spent in Thornhill ( ha ha that sounds awful and totally not what I mean!) I honestly think that I will enjoy the third book because the second book really sets up for a huge finish to the trilogy. I DID enjoy Thornhill. I am not sure if it was timing or because I needed to re-read the first book before starting it, it wasn't my favorite of the month. Fans of the first book will miss the romance of the first book but will be satisfied by the solid plot. Lack of romance is most of the times a plus point for me, haha. I don't really care for it as main theme of the book :) So, that's good and I like the sound of the plot. It has been a while since I've read Hemlock, so thanks for the warning. I will try to find a summary somewhere or read some reviews.